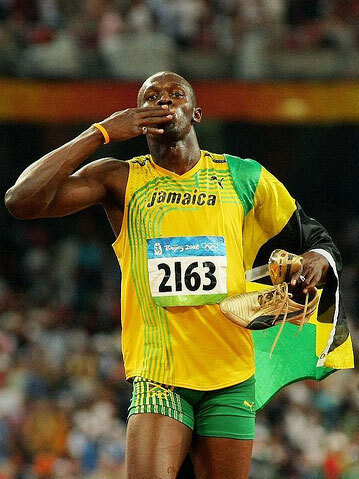 August 21st, 2008Usain Bolt Fastest Man on the Planet! 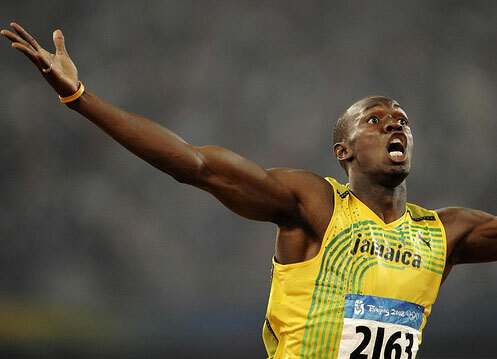 Usain Bolt wins the 100 meter race in 9.69 seconds at 2008 Beijing Olympic Games! Usain Bolt is born on August 21, 1986 in Trelawny Parish and is a Jamaican athlete specialist in the sprint races and holder of world records for 100m (9 secs 69) and 200m (19 secs 30), these two records have been established at the Olympic Games in Beijing on 16 and 20 August 2008. Usain Bolt becomes at 15 years old and 332 days the youngest World Junior champion in history of the 200 meters race, running the distance in a time of 20 seconds 61. He wins in April 2004 at only 18 years old, the junior world record of 200 meters in 19 s 93. With 19 secs 75 obtained in 2007 for 200m at the Jamaican national championships, Usain Bolt qualifies for the World Championships in Osaka. In August, Bolt finishes second in the final won by American Tyson Gay. His coach had promised Usain Bolt to let him run the 100 meters if he could run the 200m in less than 19 s 8. At the national championships in 2007, Usain Bolt crushed the national record of Don Quarrie who was the Olympic champion for the 200m in the 1976 Olympic Games, his record which dates from 1971 (19 secs 86) Usain Bolt ran in 19 secs 75. Usain Bolt than began his incredible rise. Usain Bolt is a Champion! 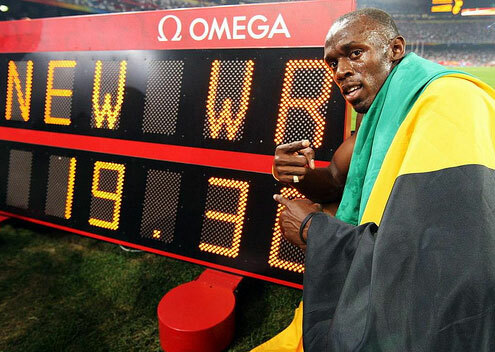 On 3 May 2008, Usain Bolt wins the second best performance of all time for 100 meters by winning the event at the Jamaica International Invitation with a time of 9 secs 76. Then, Saturday, May 31, 2008, at the meeting in New York, Usain Bolt sets a new world record for the 100 meters in 9 secs 72 this being his fifth 100 metres race. Usain Bolt beats Tyson Gay’s record by more than one tenth of a second. During the final 100 meters at the Olympic Games in Beijing on August 16, 2008, Usain Bolt beats his own world record with a time of 9 secs 69 also slowing down some twenty meters from the finish line and won the title Olympic. His left shoe laces were untied! On 20 August, he won the 200m race in 19 secs 30. Usain Bolt beats the previous world record of Michael Johnson at 19 secs 32 during the Atlanta Games in 1996. Usain Bolt is the first to win both the 100 meters and 200 meters since Carl Lewis in the Olympic Games in Los Angeles in 1984. Usain Bolt is also the first to beat both world records in a single Olympiad.